Brisbane Airport Corporation is aiming for world’s best practice in airfield ground lighting, and in doing so it has developed an award winning maintenance cycle which has improved both reliability and safety. General Manager – Assets Khrishan Tangri explains the process. How does an operator of a major international airport meet the serviceability requirements of ICAO Annex 14 – Aerodromes Volume 1 10.5 Visual Aids? As outlined in the Airport Services Manual (Doc 9137-AN/898 Part 9 Airport Maintenance Practices 2.1.1), the basic purpose of visual aid systems is to aid in the safe operation of aircraft. Therefore, the highest standards of maintenance are required. Once a system has been installed, its usefulness is dependent on its serviceability, which in turn depends upon the effectiveness of the maintenance work carried out. Annex 14, Chapter 1 defines a light is deemed to be unserviceable when the main beam average intensity is less than 50% of the value specified for that of a new light. The degradation of light output can be attributed to a variety of issues including contaminants inside and outside the light fitting, and degradation of the optical components of the light fitting e.g. lenses, filters and reflectors. In order to meet the ICAO requirements the light fitting should be serviced and restored to original condition by cleaning and replacing any components that have become degraded. Maintaining the airfield ground lighting to meet these standards is an extremely complex task at any airport. 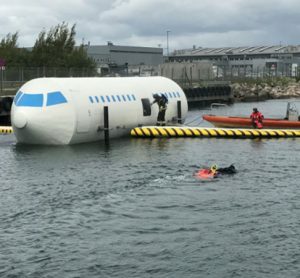 This task becomes more challenging with a single code C and above runway. During 2014 at Brisbane Airport, runway 01/19 averaged 17,485 movements per month; making it the busiest single runway in Australia and one of the busiest in the world. The time available for maintenance on runway 01/19 is limited and most efficiently conducted between the hours of 2200 and 0500. 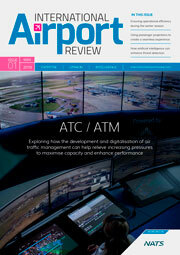 Brisbane Airport Corporation (BAC) is striving for world’s best practice. To do so, its airfield ground lighting (AGL) technical staff have taken on the challenge to meet relevant authority standards whilst operating in a safe and efficient manner. 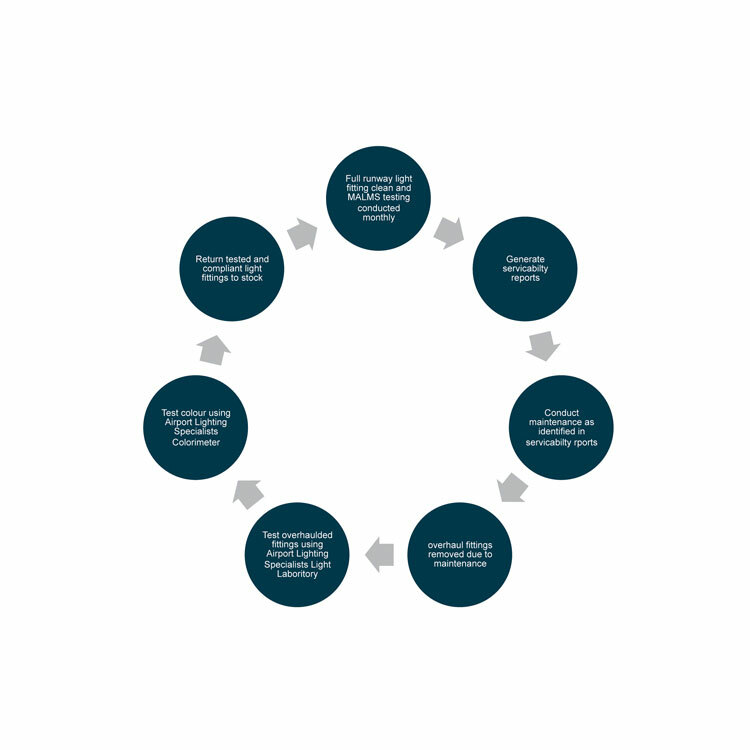 After a series of maintenance trials and various elapsed intervals between trials a four week cycle was developed to enable BAC’s AGL staff to deliver a maintenance regime that was safe and efficient whilst maintaining serviceability, which is shown in Figure 2. In short, weeks one and two, consist of cleaning all in ground runway lighting and testing for serviceability. In weeks three and four, the touchdown zone area in ground lighting is cleaned and maintained, based on serviceability tests. Without the aid of a measurement device it is impossible to determine whether or not a light fitting in the field is serviceable and meeting regulatory requirements. In order to meet these requirements, BAC researched a number of solutions ranging from vehicle mounted testers requiring a sole purpose vehicle through to trailer mounted testers. After evaluating the various systems BAC settled on a mobile system that measures airfield lighting performance against the criteria for beam intensity and orientation defined in ICAO Annex 14 and FAA AC 150/5345-46 (Figure 3). It is therefore suitable to confirm compliance with national and international standards. It also provides information to identify problems, develop maintenance strategies, and produce work schedules and maintenance reports. The system is a specially designed trailer that is easily set up and attached to any airport vehicle with a standard two inch (50mm) ball trailer hitch. It can be used by a single operator if required, though BAC’s system is operated by two trained staff members in the interests of safety. One person drives and operates the tester while the other acts as a spotter. The system is configured to test all the AGL fittings on the runway including elevated and inset fitting. The system uses a touchscreen data logger to select courses and display results. The test is performed by towing the system’s photometric sensors over the lights. Because airport runway access time is limited, photometric measurement runs need to be completed as quickly as possible and can be conducted at speeds up to 80kph without affecting accuracy. A single run can be conducted on system (e.g. one direction of runway centre line lights) in less than five minutes. 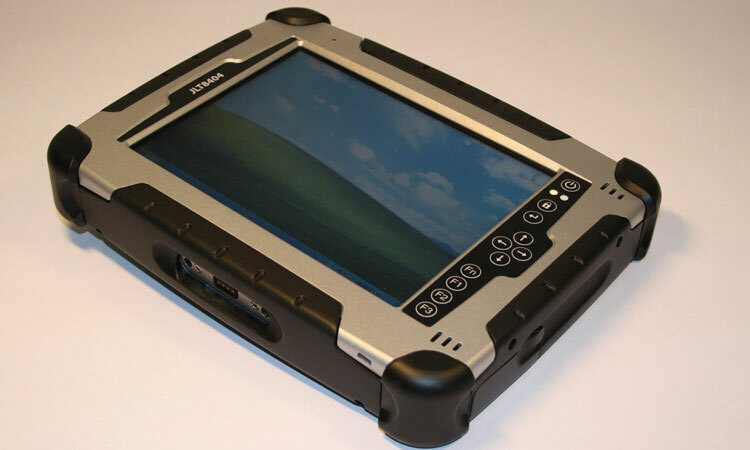 Results of the testing can be viewed at any time upon completion of the tests with the data saved on the touchscreen data logger. The data is easily transferred from the data logger to an office-based computer. Course Bar Chart Report: Which defines the performance of each individual fixture on the latest (or other user defined) survey date. As well as a visual indication of overall performance, this identifies, for airfield staff, where substandard fixtures are located. Maintenance Repair Report: A list of fixtures that, on the last survey run, were below a user defined standard. Normally the standard would be set in line with the failure level defined by the regulatory authority (i.e. 50% of the ICAO serviceability standard, 70% of the FAA serviceability standard). Alignment Report: A list of fixtures that have been consistently out of alignment since a user defined date. Serviceability Bar Chart Report: Will show the serviceability levels of each runway service tested in accordance with the international and national standards for a CAT I or II/III runway. Isocandela Diagrams: Show beam orientation and beam intensity, either for all fixtures or those listed on the repair report. This information can be used to differentiate between different types of fault (such as low light output and poor alignment) and hence define maintenance requirements. Isocandela diagrams for both sides of an individual light unit on two consecutive dates can be displayed alongside each other to show the difference between the two photometric tests. 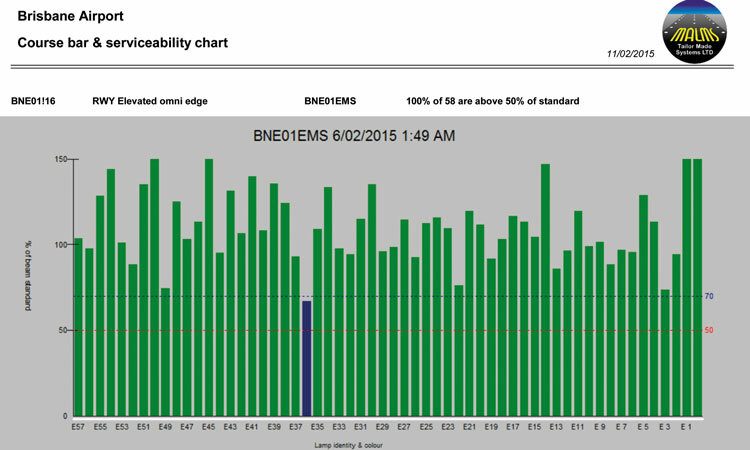 This provides a visual indication of changes in fixture performance and effectiveness of planned work activity. Location History Chart: A bar chart showing average intensity for one or both sides of user specified fixture over time. This provides a visual indication of trends in individual fixture performance. A maintenance job sheet enables the technician to view the data recorded on the most recent run as well as the previous run. The information on the job sheet includes beam alignment average light output light output ratio. This enables the technician to rectify the light fitting or replace it. The technician is able to comment on the actions undertaken on the particular fitting to bring the light position back to a serviceable state. When a light fitting is removed from service due to serviceability levels, the fitting undergoes an overhaul where any faulty or worn components are replaced. The lamp is also changed and the fitting fully cleaned. 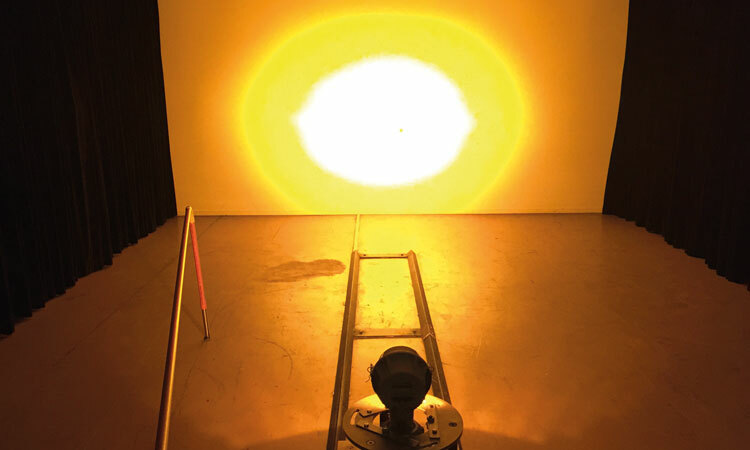 Once the light fitting is overhauled it is then tested in BAC’s own photometric laboratory (Figure 4). The photometric laboratory enables the AGL staff to prove a light fittings compliance with regulatory requirements before being placed in the spares store for reinstallation when required at a later date. A report is generated for each light fitting that is tested in the laboratory and kept on file for later reference. The report contains results as measure for that particular fitting along with those that are prescribed by the relevant regulatory requirements. Each field is given a pass or fail and based on these results the overall fitting is given a pass or fail. Once the light fitting has passed in the light laboratory, the next stage of the process requires colour testing utilising a colorimeter, which measures colour against the regulatory standard (Figure 5). The colorimetric tester records the chromaticity coordinates measured of the light fitting and records a pass or fail based on the CIE 1931 Chromaticity Diagram, showing colour boundaries for aeronautical ground lights. Once the light fittings have passed all testing requirements they are placed into the spares store ready to be installed as fully serviceable compliant light fittings. 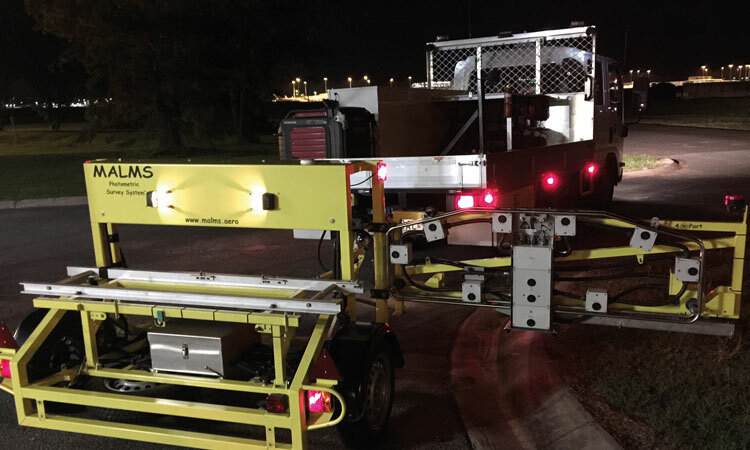 As a result of utilising the mobile testing device in conjunction with the photometric laboratory and the colorimetric tester, BAC AGL staff have been able to more efficiently and safely ensure that our runway lighting system is safe, serviceable and reliable. The system was initially purchased to improve the efficiency of airport lighting maintenance due to the limited access time to the busy runways, but it was soon determined that there was also an improvement in safe work practices due to not having to remove suspect fittings, requiring less physical handling and reducing the risk of FOD being left on the flight strip. The BAC Airport Lighting team received the Australian Airport Association (AAA) Airport Safety Award – Major Airport – Queensland in 2014 for this initiative. Brisbane Airport (BNE) operates 24 hours a day, seven days a week, with two major terminals servicing 28 airlines flying to 68 destinations. A suburb in its own right, it is the largest airport in Australia by land size (2,700 hectares) and was the second busiest capital city airport in Australia in 2014 with 219,904 aircraft movements. With passenger numbers forecast to more than double by 2034, BNE is on the cusp of the most exciting phase in its history which will see more than $3.8 billion privately invested over the next decade to build critical infrastructure at the airport. 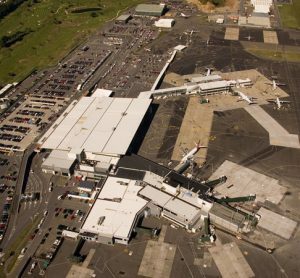 Projects include a ‘New Parallel Runway’, new car parks and access facilities, terminal expansions, road upgrades, new aprons and aeronautical facilities and a number of new commercial buildings. Due to be completed in 2020, the new 3.3km runway (as well as 12km of taxiways and additional infrastructure) is being built on 360 hectares of soft marshland 2km west of the existing runway. 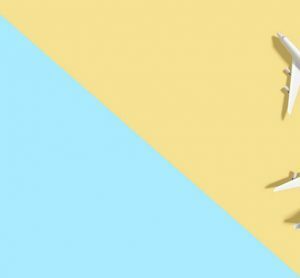 Accommodating the ongoing growth in passenger numbers, the runway is expected to deliver a regional economic benefit of $5 billion per year by 2035. 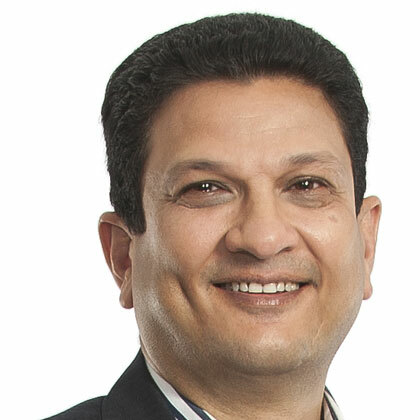 Krishan Tangri MBA, M.Cons Mgmt is General Manager – Assets at Brisbane Airport Corporation. He has over 25 years of infrastructure, facilities asset management and construction management experience. 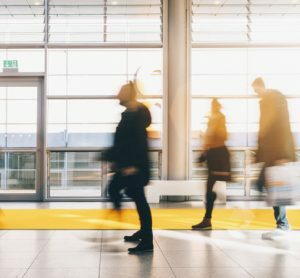 Prior to his appointment at Brisbane Airport Corporation, he held senior management positions in both facilities and construction management with Sydney Airport Corporation and Brisbane City Council. He has an MBA (Major in Finance), Master of Construction Management and Bachelor of Engineering.